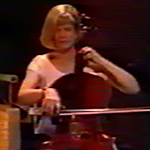 Catherine Black played cello with The Divine Comedy during the Promenade tour in 1994. Therefore she replaced Chris Worsey who played on the album and during the Liberation tour. She has also performed for other pop artists such as Edwyn Collins, Boyzone or Demis Roussos. As a classical musician, Catherine has played for the Instrumental ensemble. She has also founded the String Theory Cello Ensemble and the Baroque & Roll String Orchestra. And when she is not playing she is teaching, she has published the Time Pieces for Cello series.